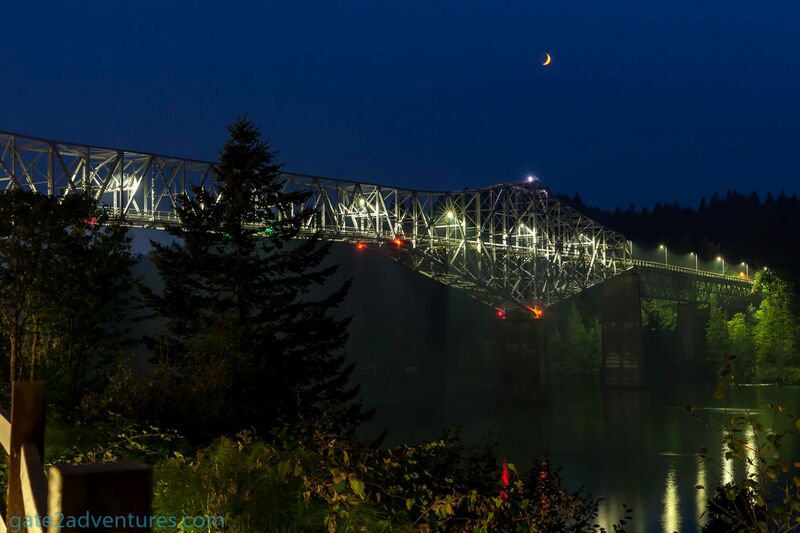 Cascade Locks, is a beautiful small city located in the Columbia River Gorge National Scenic Area. The city got its name from a set of locks built here to improve navigation along the Columbia River and past the Cascades Rapids. 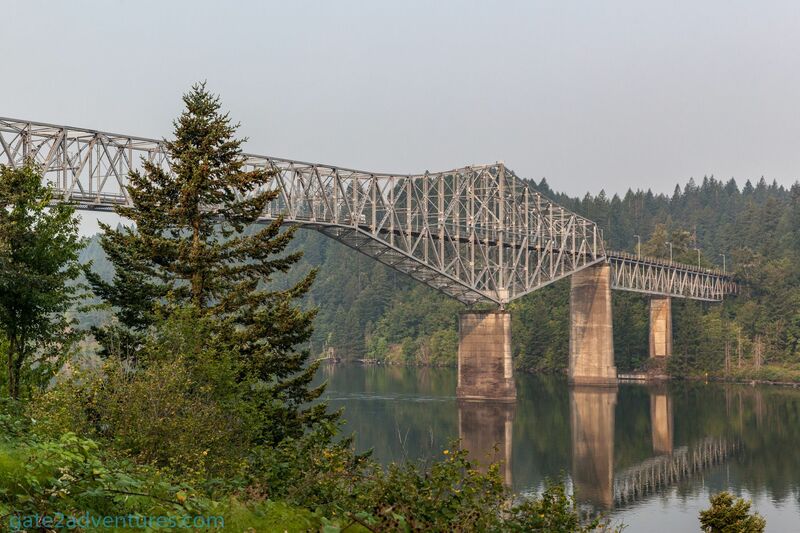 Today the locks are not used anymore but parts of them survived and are now a small island in the Columbia River which is used as a park and often used for weddings. 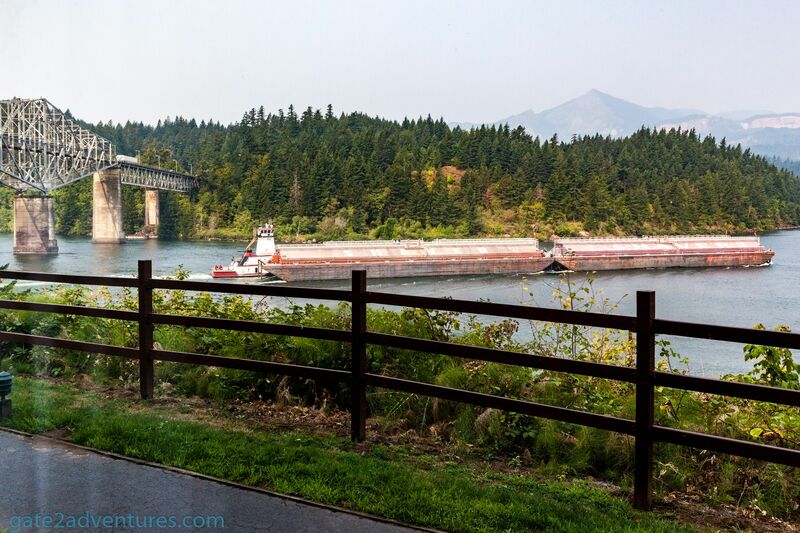 Cascade Locks is also home to the Columbia Gorge Sternwheeler which you can hop on to take a small cruise on the Columbia River. 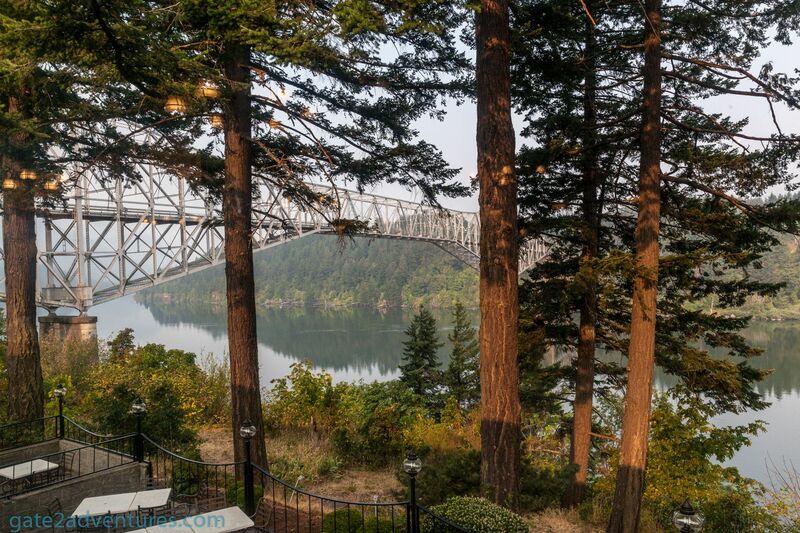 The most famous attraction nearby is probably the Bridge of the Gods which crosses the Columbia River just a bit west of the Best Western Hotel. I drove by this place so many times, but never had any real time for a stop or even to spend the night here. A couple weeks ago I finally got a chance to stay overnight and it was awesome. 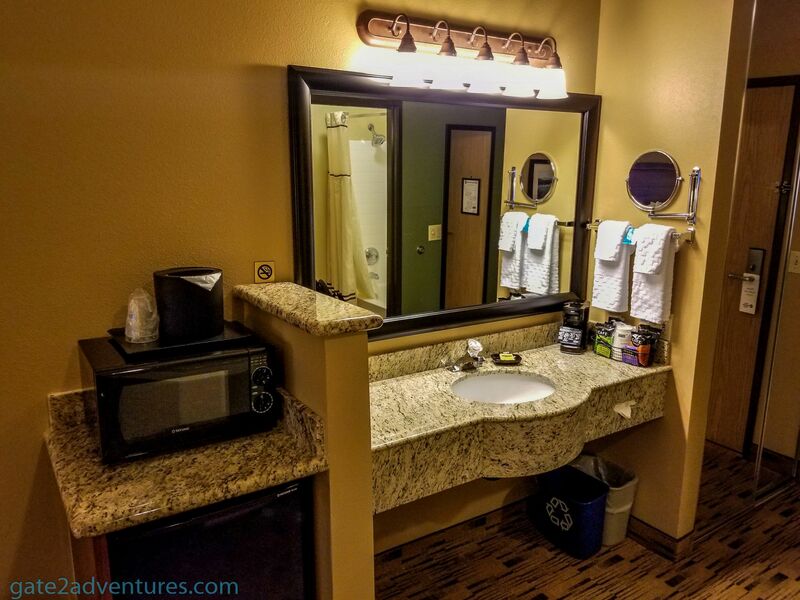 Best Western Hotels give me kind of a historic feeling while on road trips. I love Best Western for that. 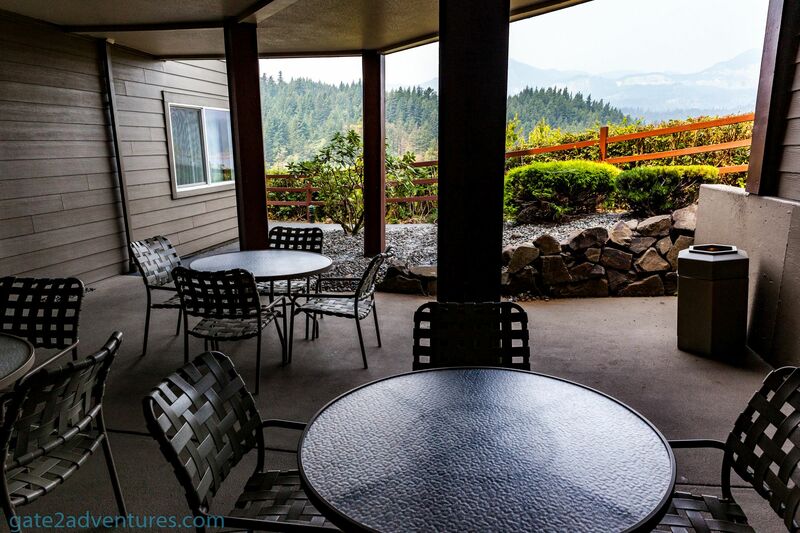 The Columbia Gorge National Scenic Area is just gorgeous with amazing views. However, the nearby wildfires interrupted the view as there was a lot of smoke in the air, which reduced visibility drastically. I made my reservation through the app just about 45 minutes before I checked-in. After that, I jumped in my rental car and headed towards the hotel. I got there about an hour later and they already had my reservation ready. I got greeted with a welcoming hello and my check-in was done mere seconds. The front desk clerk was super nice and we had a quick chat. He gave me an overview of the property. My room was on the first floor. Too bad, as I wished to have a room on a higher floor for better views of the river and the bridge but this was the only available room left for tonight. The lobby is actually located on the second level and you have to get down one floor. After exiting the elevator a floor lower, I stepped into my room, which was just around the corner from the elevator. The room is narrow but very deep which gives you a huge room. To the right is a closet followed by the washbasin with coffee maker followed by the microwave on top of the refrigerator. The refrigerator has a decent size, great to store your supplies for a longer stay. 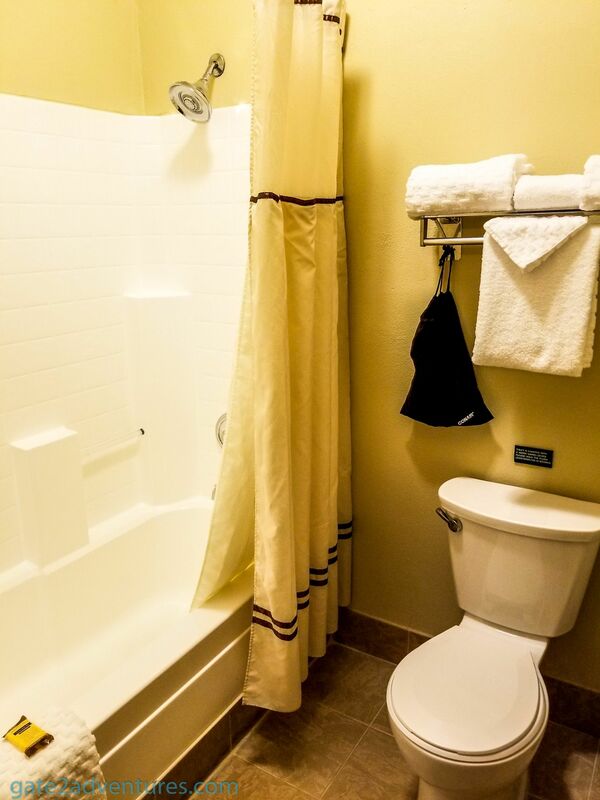 To the left is the bathroom with a bathtub and showerhead. 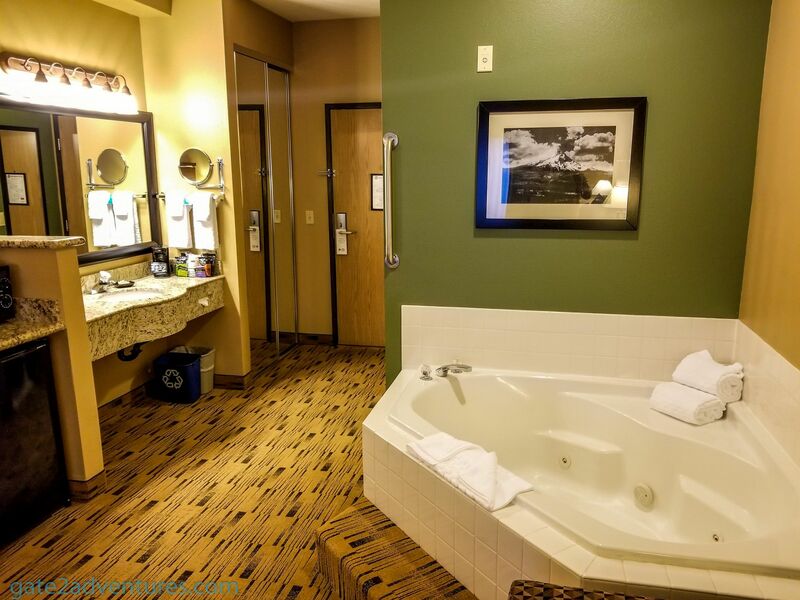 Continuing on the left side is a whirlpool followed by a loveseat with a table and then the King Bed. Adjacent to the bed was a flatscreen TV sitting on top of a closet to store your stuff. Next to the window is a work desk and underneath the window is the air condition unit. I hate this placement of A/C unit and work desk. When you turn on the A/C it will blow directly on you and makes you freeze. But unfortunately, many of the hotels use the same setup. 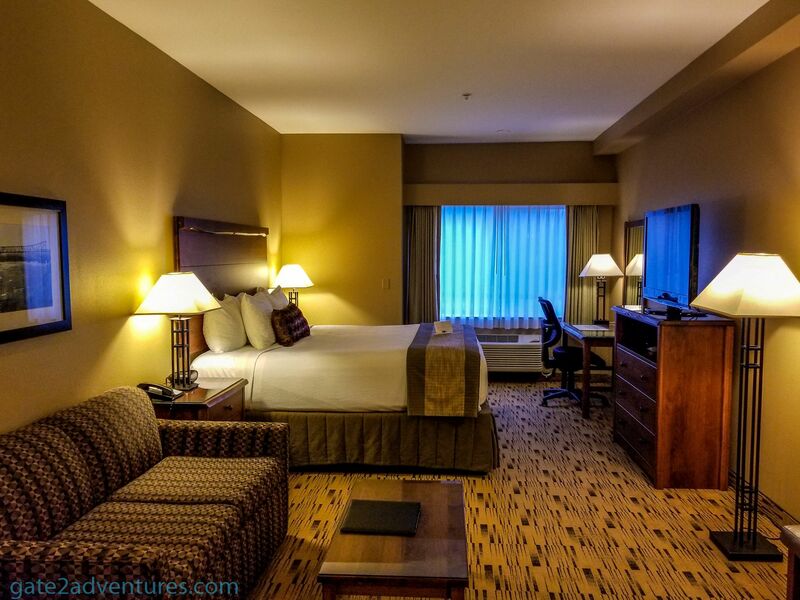 The room was very very spacious and the window had a view of the river and a partial view of the bridge. Directly behind the hotel are a set of railroad tracks. Don’t worry about getting annoyed by trains as they don’t blow their horn while passing in this area. Also, the tracks sit on a lower ledge than the hotel, you bearly hear the train engines. 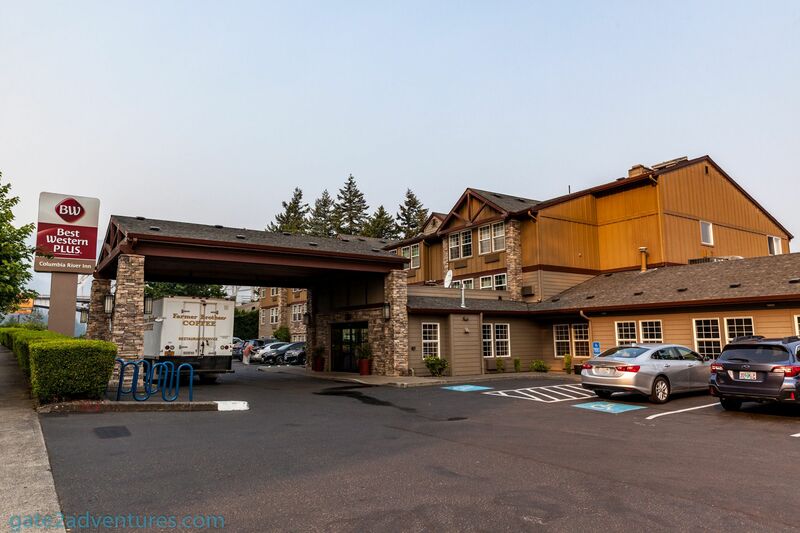 Overall the hotel and furniture are a bit dated but that’s what gives Best Western hotels their flair. As mentioned earlier, the lobby is on the second floor. 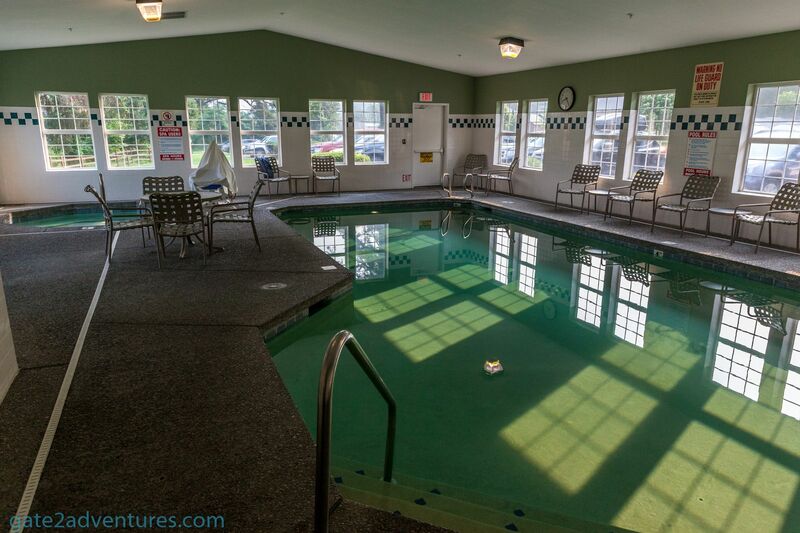 This is also where most of the other amenities of the hotel are located. The lobby area has a small seating area to hang out while you wait for other people from your party. 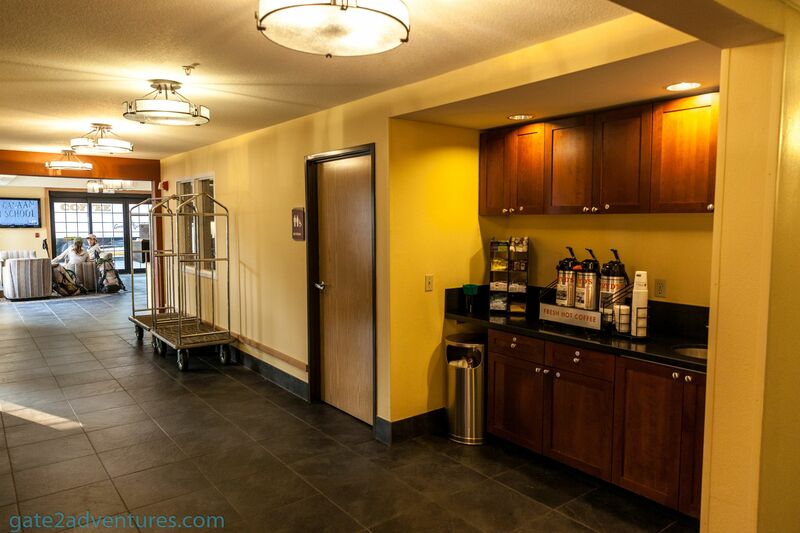 Along the hallway from the front desk to the elevator is a small coffee are to your left. 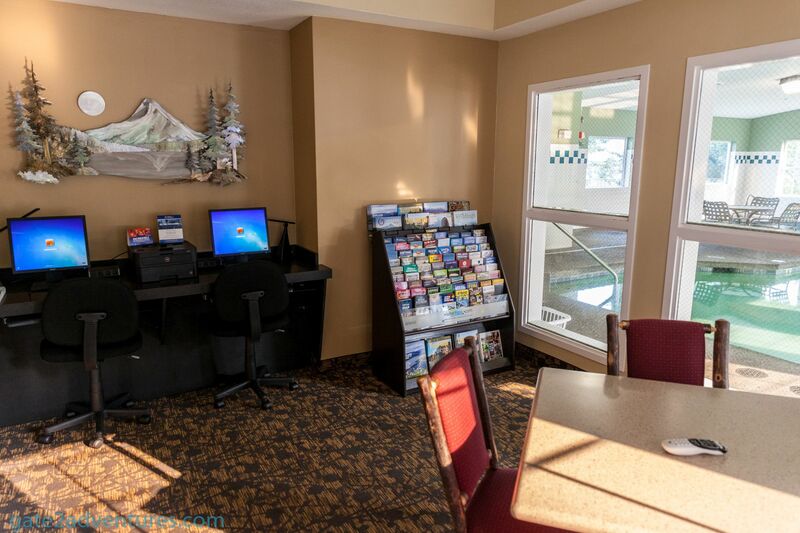 To your right, you will pass the business center, which is located in a smaller separate room with a table and two PC workstations. 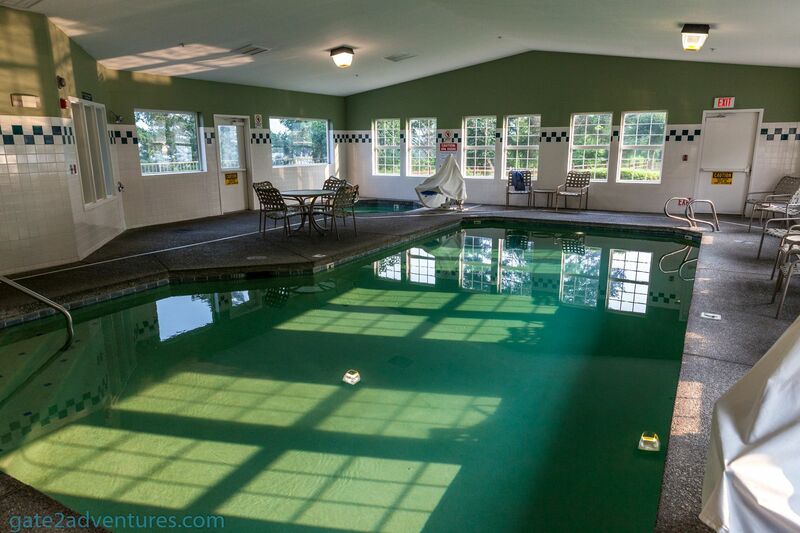 The business center has a view of the indoor pool. 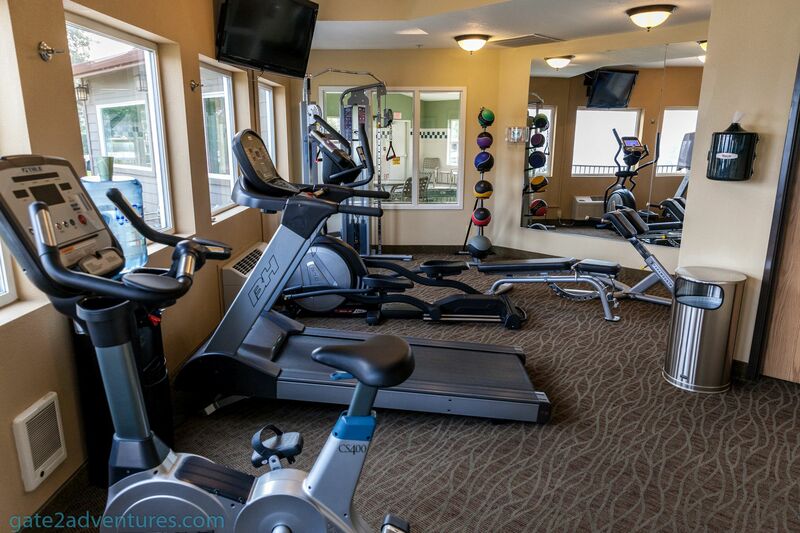 Next to the pool is the fitness center. 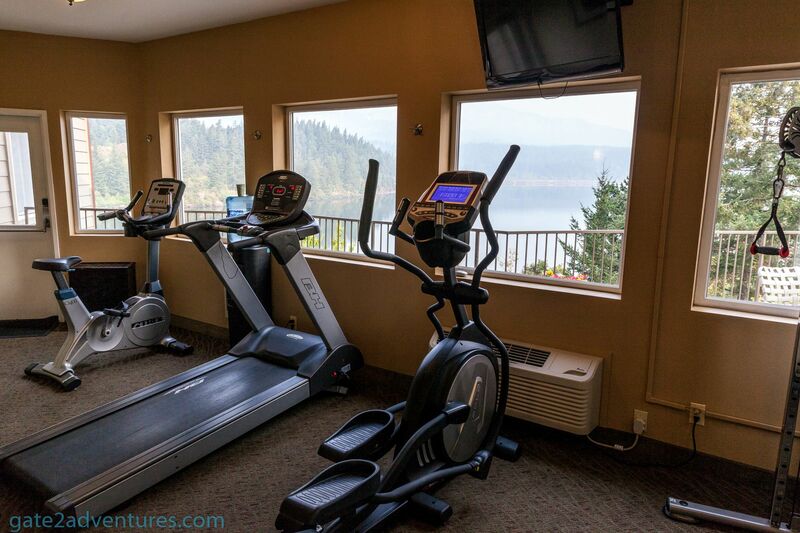 Its a rather small fitness center, but has the basic workout equipment and while you are on the treadmill you get a view of the Columbia River. Unfortunately, all the smoke from the wildfires in the area made the view less desirable. 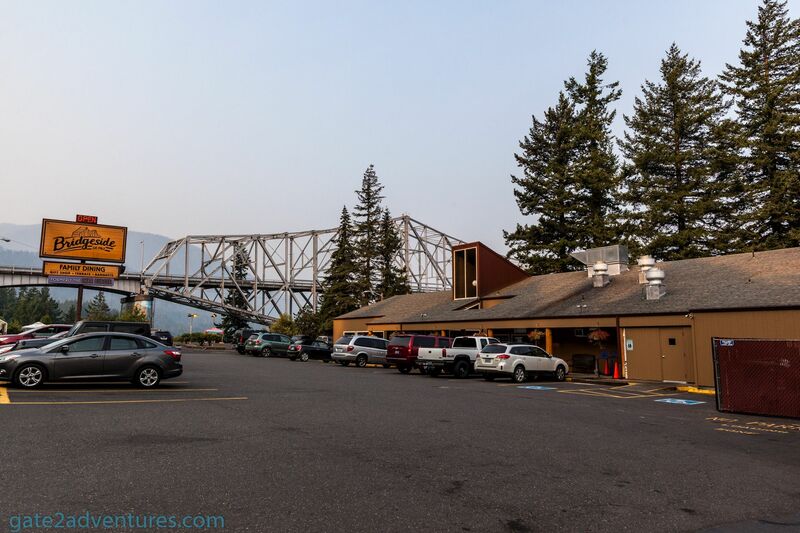 There is a walkway behind the hotel which gives you a good view of the bridge and is great for a small walk. On the east side of the hotel, there is some outdoor seating available on the first and second floor. The hotel itself has no on-site restaurant neither is breakfast served here. 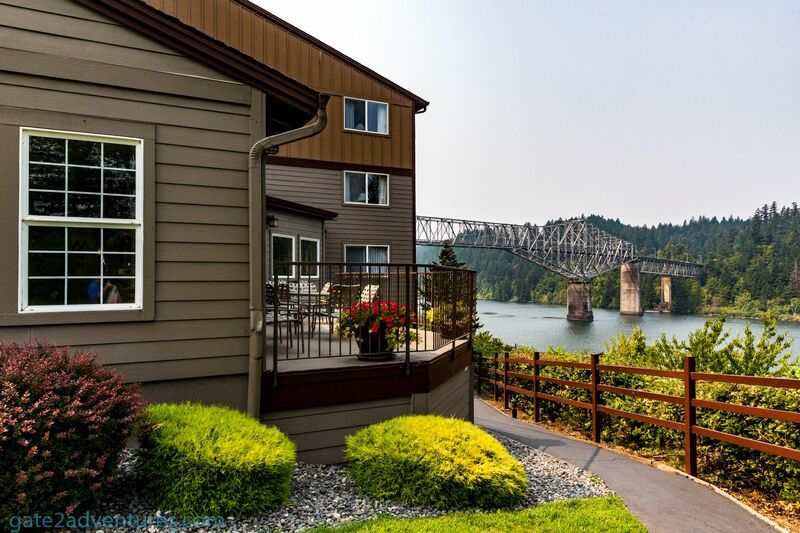 The complimentary breakfast with your stay is served at the next door “Bridgeside” restaurant. The restaurant doesn’t offer a breakfast buffet, it only offers a-la-carte dining. Bring your coupon to the restaurant and they will tell you what is included in your breakfast. Unfortunately, you have to decide rather you want coffee or any juice as only one of them is complimentary and you would need to pay for the other one or skip it altogether. Usually, a breakfast in the U.S. always comes with coffee and juice included. Once you ordered at the counter you get a number and you can take a seat wherever you want. I was lucky enough to grab a seat next to the window to get a view of the river and the bridge. A few minutes later a waitress came with my breakfast order. The food is great here as well as the views if you can grab a seat along the window. Besides breakfast, they serve lunch and dinner as well. Unfortunately, you can’t charge any of that to your room. I really wish the hotel could set up a deal with the restaurant to make room charges possible. I am sure people would use it. 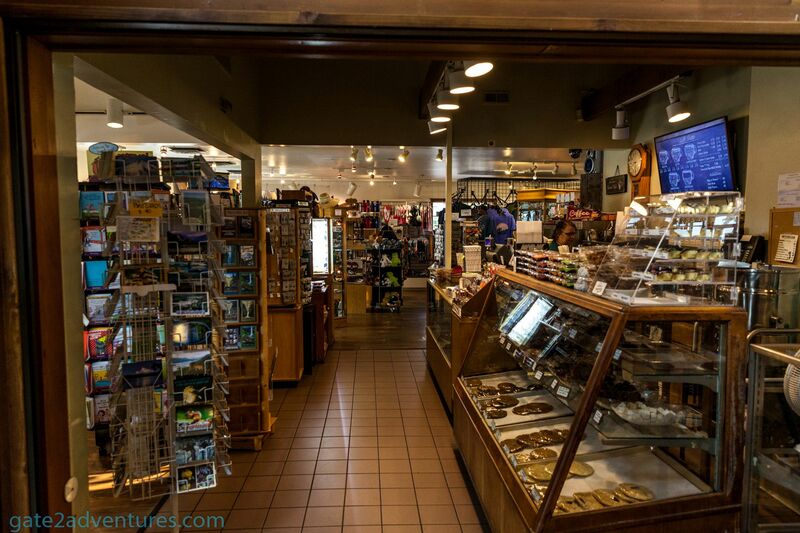 As you walk into the restaurant there is a gift shop on your left if you are in need of some souvenirs. I stayed only for one night, but this is definitely a great location to stay. 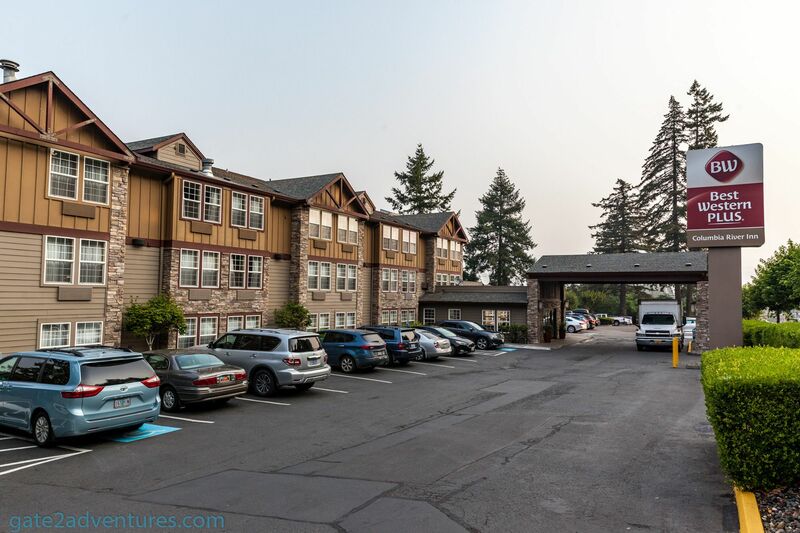 The city of Cascade Locks is located near many attractions inside the Columbia River National Scenic Area. The staff at the hotel was great and friendly. 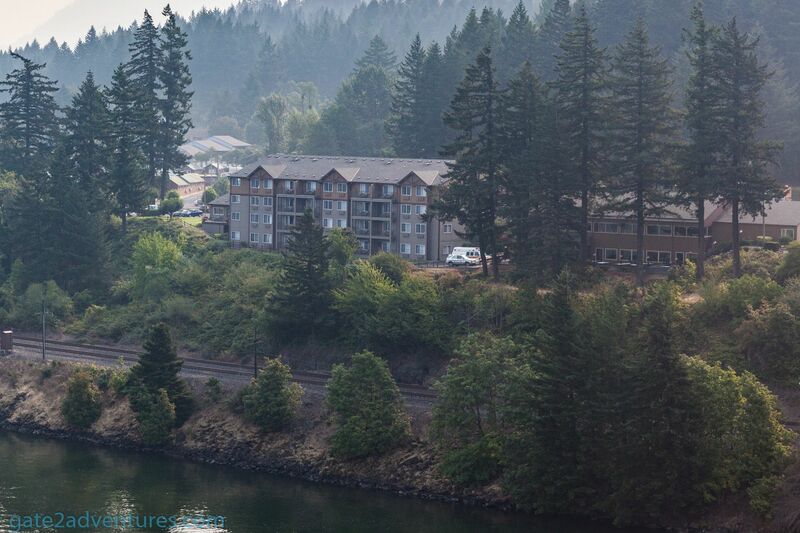 Views of the river are great here, if you get a room with river view and if there is no smoke from a wildfire in the area. I had no issues during my stay which would affect the stay in a negative way. The only “negative” issue I has, was that my room was on the ground floor. Rooms on a higher floor have a better view and also a small balcony. 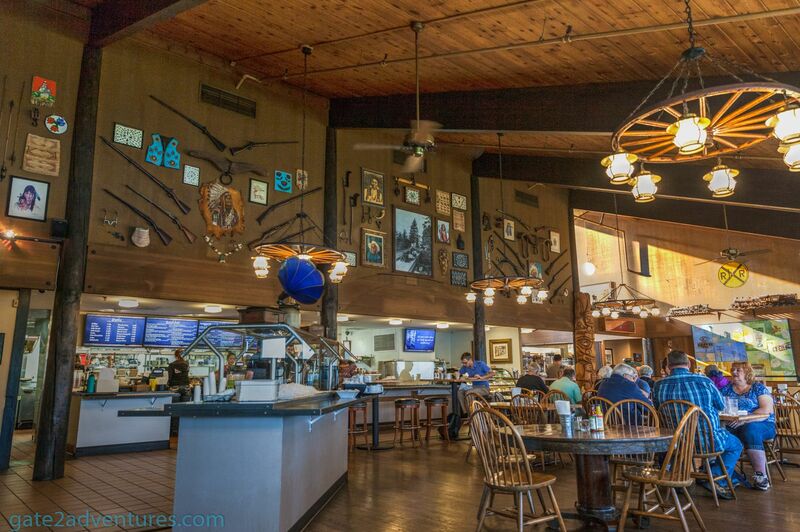 Dining, including breakfast, is available at the nearby Bridgeside restaurant.